Amy Jurries is the Founder and Editor of The GearCaster. 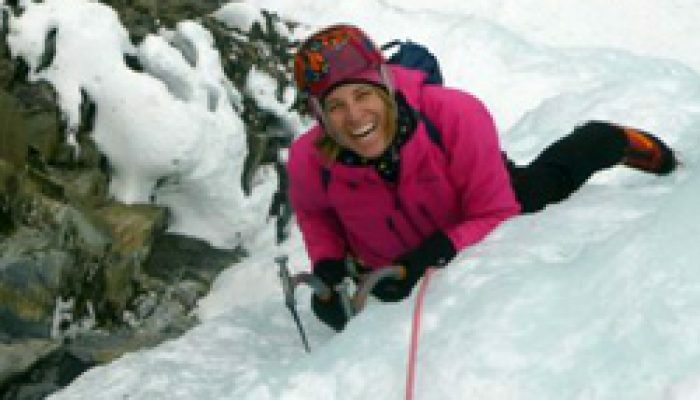 She is addicted to ice climbing but can also be found mountaineering, rock climbing, cycling, mountain biking, hiking and trail running with her dog Lola. Amy has been climbing for almost 20 years. A successful summit of Kilimanjaro fueled her passion for mountaineering and alpine climbing, with numerous ascents now on her climbing resume including Mont Blanc, Elbrus, Aconcagua, Denali, and Kosciusko. She took up technical ice climbing 6 years ago and has never looked back, traveling to all parts of the globe in search of steep, frozen waterfalls and putting climbing boots through their paces. She dreams of one day scaling a large Himalayan peak such as Ama Dablam. Amy is founder and editor of The GearCaster in addition to freelancing for many outdoor publications such as Outside Magazine. She spent over 10 years as a mobile industry executive and 5 years in the Venture Capital industry before deciding to turn her passion for the outdoors into a full time job four years ago.